So, unfortunately it seems that these strava route maps don’t really zoom. This link , however, will take you to a public strava page.. and you can at least zoom in and out on the map, albeit not full screen. So, anyway… I’ve decided to document our ride with two posts for each day. One with the map of the route we took, along with general route information, and our evaluation about the pros and cons of the road conditions, so that anyone searching the net (as we did before our trip) can read about that stuff, without having to wade through our more personal journal. The grand plan for the whole ride was to avoid the highway as much as possible. Doing that will always be a more hilly route, and it’s tempting to ride the highway to get from A to B more quickly (and usually with less ‘up’). That said, we are wanting to ‘tour’… and while the newer the dual carriageway sections of the highway, the wider (and smoother) the shoulder, the roar of trucks and cars whizzing by at 110kph isn’t the most appealing way to travel. It’s also worth noting that Google maps is not keeping up very well with these new Pacific Highway bypasses. A recent update/upgrade to Google maps actually went ‘backwards’ in our area. They used to have the correct mapping for the newly formed ‘local/service’ road – ‘Solitary Islands Way’ that runs along the new Sapphire to Woolgoolga upgrade section. With the new look maps, they lost all that, and seemingly mapped it from the satellite images taken during the construction period, and got stuff completely wrong! (Like Solitary Islands Way not being continuous in one part!) I did flag a couple of things, and Maps did eventually change them, but they still have road names wrong… So it does make me realise that other areas experiencing upgrades are likely to be experiencing the same issues. In other words, don’t rely totally on Google maps around highway upgrade areas!! Back to riding through Coffs. There’s no option but to ride the highway shoulder between Sapphire (where the local road merges back into the highway and Coffs. The hill (at the Big Banana – ie. Macauleys Headland hill ) is a pain… there is a shared path on the eastern side, but it’s not ideal, and a shocker to get onto at Diggers Beach Road. It’s also not that wide, and it has a few obstacles. Heading south the shoulder is wide enough (heading north is another story…) and we recommend taking the lane on the downhill. We headed down the highway to the City Centre (Harbour Drive) for lunch. You can peel off left at Arthur Street, which heads east, then bends around to become North Hogbin Drive. There are shared paths, but I’d suggest you ride the shoulder north of Orlando St roundabout, and take the lane through that roundabout, the big one at Harbour Drive, and the Howard St/Albany St roundabout. You could turn right at Stadium Drive roundabout (at the University/Education Campus) and then ride the Pacific Hwy shared path all the way to Lyons Rd. We opted instead for continuing on to Sawtell Road roundabout, and then riding Toormina Drive. Sometimes shared paths and tandems (especially loaded tandems), especially where they cross side streets, can be a pain the proverbial and there are a few tight turns on that Pacific Highway path. At Lyons Rd, we again opted for the highway instead of Pine Creek Way, but by the time we’d taken the Repton exit at Keevers Drive we’d had more than enough of the noise. Pine Creek Way is heaps quieter, more scenic, but of course, hillier. Also, not new to us, so expediency won out for us on this particular day. As of time of writing this (20/9/16) Google maps shows nothing of the changes. If you’d like a bit more scenery, duck into Urunga and then follow the road through Hungry Head till you rejoin Giinagay Way. 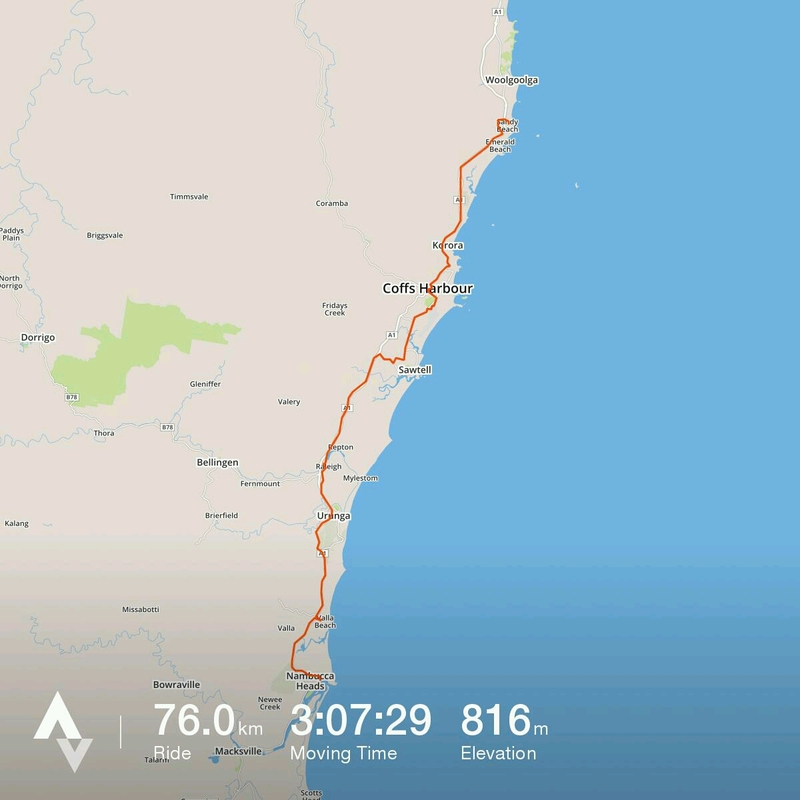 Again, been there done that for us, so we stayed on the main (but now quiet) road all the way through to Nambucca Heads. We did take a break again at Valla Beach, and found a cafe on the left not far past the Tavern. The Nambucca/Macksville bypass isn’t due for completion until the end of 2017, so it’s hard to know how it will end up. Currently the Urunga bypass section merges back onto the current Pacific Highway at North Nambucca, and Giinagay Way is forced up Link Rd then up a steepish hill on Old Coast Road and Mann St, and then down through town. Our motel was down the other side, nearer the river, so there would have been less climbing if we’d been able to turn left at the River (Riverside Drive) and ride that-a-way.